At first glance, the Superman II online slot looks completely unremarkable, but then so too does Clark Kent in his journalistic guise. A static set of reels, floating above the city of Metropolis, may lure the gamer into thinking this is a pretty ordinary slot title! 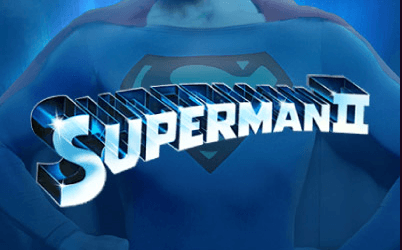 Play Superman II For Free! Following the success of the first movie in the franchise, Christopher Reeve duly slipped back into his snug blue tights to continue in his role of Superman, with Gene Hackman back as his arch enemy Lex Luthor. The film was another box office smash, and this slot title from Playtech has enjoyed equally rapturous reviews from gamers. And this is all thanks to the generosity of its payouts and the feeling it creates that every spin of the reels could be a life-changing one. 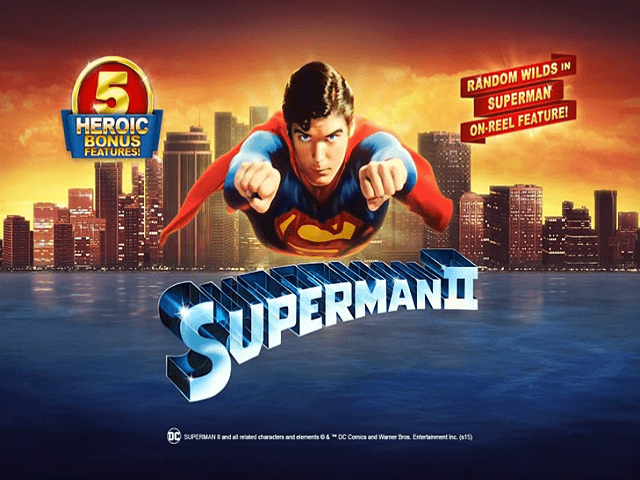 That’s because this Superman II slot game features an astounding four progressive jackpot amounts and two special features – the second of which can trigger a secondary set of five bonus games! At first glance, the Superman II online slot looks completely unremarkable, but then so too does Clark Kent in his journalistic guise. A static set of reels, floating above the city of Metropolis, may lure the gamer into thinking this is a pretty ordinary slot title. But like Clark himself sliding into the blue spandex, the initially average is often far more exciting than it first appears. And it’s fair to say that Superman II’s looks are rather deceiving. The five reel, 25 payline setup is as ordinary as it gets, but the real magic unfolds as soon as you hit that ‘spin’ button. The main game symbols in Superman II are the various characters from the movie, so alongside Superman himself and Lois Lane you’ll find General Zod, Non and Ursa. These each trigger a payout when you spin three or more of them on a payline from left to right. The top prize available here is a staggering 1,000x your bet amount when revealing five of the Superman symbol on your reels. The ante is upped yet further by the two special symbols. The wild, which is the classic red Superman logo, pays a knee-trembling 5,000x your bet for a full set of five, while the Daily Planet logo on reels 1, 3 and 5 triggers the bonus round of the same name. And keep your eyes peeled for the man in blue flying over your screen. This is the Superman Wild feature, which is randomly triggered and features the great man turning 2-4 of your symbols wild – hopefully creating bigger and better winning combinations. The Daily Planet special feature sends players on a journey to one of five bonus games: Phantom Zone, Skyline Fight, X-Ray Vision, Lois & Clark and Battle for Metropolis. This is randomly selected by hitting the stop button on the newspaper. The Phantom Zone is a 2x2 grid that acts as a wild, with unlimited free spins (yes, you read it correctly) awarded until the bomb symbol appears on your reels. Skyline Flight is another free spins round, with plenty of multipliers and limitless freebies up for grabs. But watch out for the devious General Zod: he’ll reset your free spin count to one if he lands on the third reel. X-Ray Vision is a 15-free spin game which features standard symbols turning wild, while Lois & Clark and Battle for Metropolis are ‘pick ‘em’ style games with prizes of up to 2,500x your stake up for grabs. Browse the top online slot casinos to enjoy this title!